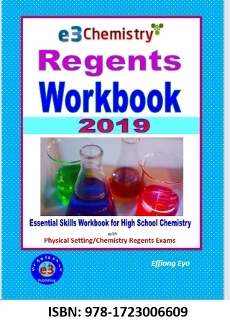 A highly organized high school chemistry workbook with 61 different worksheets, each consisting of many sets of questions on relating concepts to test students knowledge and understanding in several essential areas of chemistry. This edition contains two practice Regents exams.
. Comprehensive for a whole year of class work and homework PLUS Regents exam practice. It has two practice NYS Chemistry Regents exams. The Essential Skills Workbook doesn't. Therefore, this edition has 50 more pages than the Essential Skills Workbook. This edition is a better fit for Regents chemistry in New York. Teachers in other states can also use this edition for additional practice questions.